By making work items at home in Outlook, TeamLook houses all your necessary communication tools in one extremely efficient and natural workspace. TeamLook is the bridge between management and development: it effortlessly incorporates Team Foundation Server’s economy of work items to the decades-proven business coordination environment of Microsoft Outlook. TeamLook allows for an information exchanges in which work items and email are equal players. In fact, with TeamLook, one is easily converted to the other. 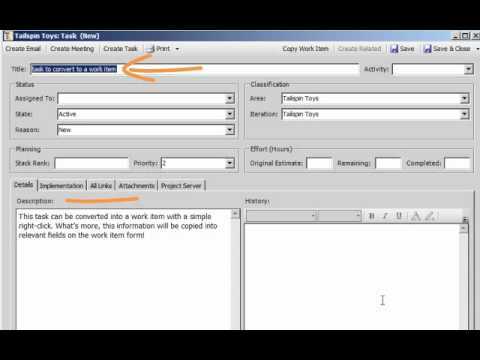 Right-click on an email and you easily create a new work item from it, or attach it to an existing work item. Right click on a work item and you can quickly draft an email or schedule a meeting with the work item’s content in the message body. TeamLook allows you to communicate with clients and management through the tools that they’re used to and to interface with your development team through the system that they work in, making you the most powerful communicator in your organization. Use Microsoft Outlook to create new Team Foundation Server (TFS) work items with TeamLook from Outlook Tasks, Meetings, or Emails. Use TeamLook to create Microsoft Outlook emails, meetings, and tasks from Team Foundation Server (TFS) work items.